TSA Drops Ban on Lighters in Carry On Luggage! Lighters now allowed, there are a number of restrictions on this so please read the article linked to above for the full scoop! We are constantly updating our extensive inventory of other butane lighters from companies like Colibri lighters, Prometheus lighters, Vector lighters, Dupont lighter, Xikar lighters, Bugatti lighters, Porsche Design lighters and many more. 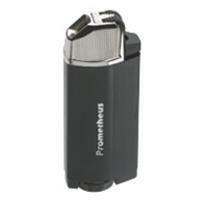 Choose from our fine selection of cigar, cigarette, pipe and specialty lighters. Within these pages, you'll find liquid fuel lighters, butane lighters, soft flame lighters and torch lighters; table-top lighters or slimline pocket lighters, we've got you covered! This month's special is to announce the launch of the fabulous butane lighter inserts from KGM. They are the makers of some of the finest butane lighters in the world and we convinced them to allow us to sell the lighter inserts that are normally found in their Thunderbird lighters seperately. This is great because they just so happen to fit standard sized Zippo lighter cases perfectly! No more muss, fuss and smell associated with liquid fuels; just clean burning butane in a pipe lighter and traditional style. In our cigars, lighters and pipe shop please enjoy your on-line shopping experience. Whether you are new to shopping on-line or an experienced pro, we are here to help you with any questions or concerns you may have. For security we use the latest SSL128-bit encryption features with our secure on-line ordering system. In addition you always have access to our free 24 hour order line, and are always welcome to call or e-mail us with any other questions you may have. We have been in business over 30 years with our most important commitment being providing you with our dedication to customer service and your complete satisfaction.